The year began with a trip and a new passport stamp, as I got back in shape after a winter bout of bronchitis. 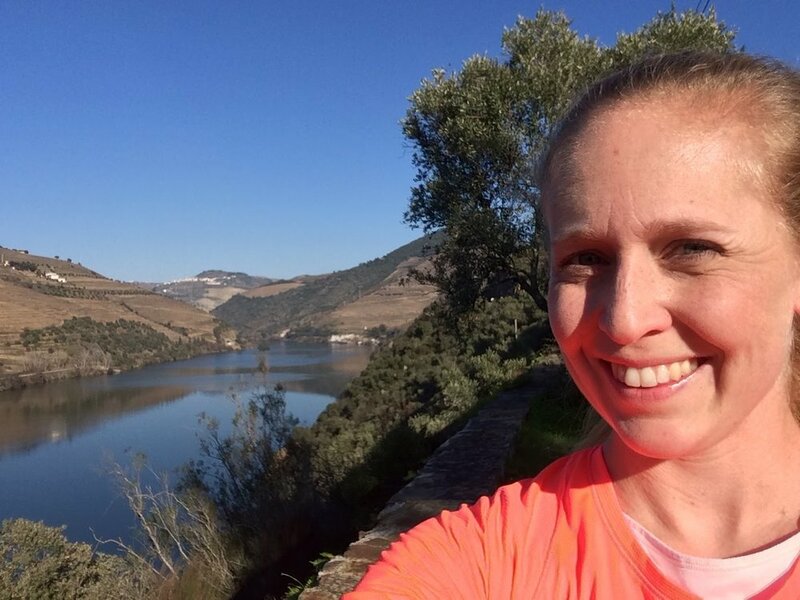 Avi and I visited Portugal ahead of my 30th birthday, and I explored some beautiful running routes in Lisbon, Porto, and the Douro Valley. It was a perfect way to kick off a joyful year of running! March brought my first race of the year, the USA 15k Championships in Jacksonville, Florida. I've run this race many times, and this year was finally my year! I finished 7th against a field filled with Olympians and was thrilled to kick off the season with a strong start. I also officially signed a contract with rabbit, the California-based running apparel company founded by two pretty special women I'm lucky to call friends - Monica DeVreese and Jill Deering. It's been my honor and pleasure to represent rabbit this year and partner with an extraordinary company! I also continue to represent Strava Track Club, the team I've been part of since I start running post-collegiately in 2010. Spring means track season! I made the usual pilgrimage to Palo Alto to chase fast times at Stanford, and was rewarded with a new 10k personal best at Payton Jordan. I was overjoyed to run 31:55, cracking that 32 minute barrier and running the Olympic A Standard in a time that ended up being 8th overall in the US this year. I also raced on the roads and on the track in Boston, Charleston, Green Bay, Atlanta, and at home in Sacramento at the USA Outdoor Nationals in the 10k. Unfortunately, a severe ankle sprain in May resulted in some missed training and subsequent performances that left much to be desired. Still, I was grateful that it was only a fluke accident and not a long-term injury. I finished the spring bummed, but eager to bounce back. In between races, I finished up my first full year of grad school! The spring semester was a tough one -- I was thrilled when biostats was over! -- but I really enjoyed my classes on qualitative research methods and health communications, as well as being a TA for my mentor professor in his global nutrition class. Summer brought new adventures and also new challenges. I had the opportunity to spend July and August in Cape Town, South Africa, doing research for my graduate thesis. I worked with a group of women living in Khayelitsha, a township outside of Cape Town, learning about their experiences living with and managing obesity-related chronic disease. The research portion was fruitful and I hope my work on Type 2 diabetes and hypertension will prove helpful for those living with the diseases. The run views in Cape Town were stunning, and the sunsets epic. Here's just a small sample of the epic runs I got to go on! And grow I did! It was a summer of listening & learning, exploring, and facing challenges head-on. I came home thankful, happy, and ready to seize the next opportunity ahead! Back from South Africa, I attacked the fall season with a vengeance - it was marathon training time, baby! I put together my best marathon buildup to date and earned podium finishes at races along the way in New York, Connecticut, and Massachusetts. All these workouts and races were leading up to the big one -- the California International Marathon/USA Marathon Championships in Sacramento. In short, CIM was a really special day. I've yet to write the race recap, but the short story is the race went very well and I'm thrilled with my 7 minute PR and 5th place finish :) I ran 2:32:08, splitting 1:16:05/1:16:03 -- those 5:48s never came so easy! Despite coming down with a poorly timed head cold the day before the race, my body cooperated with me for 26.2 miles and I felt like I was flying all the way from Folsom to Sacramento! Buoyed by cheers from family, old teammates, coaching clients, and friends, I ran with a big smile, and burst into happy tears at the finish line, reveling in yet another big goal achieved. When I started this blog over 7 years ago (!! ), it was my goal to qualify for and compete at the Olympic Trials - and at CIM I punched my 4th ticket to the Trials, this time to the 2020 Marathon Trials. It's been a wild ride, and I'm full of love for all the people who've helped make this pro running dream such an incredible reality. Outside of racing and grad school, I also had the pleasure to coach a fantastic group of runners across the country. Training Joyfully athletes had a year for the books, with first marathons completed, Boston Qualifying times achieved, new personal bests notched, and many joyful miles run. I'm so honored to work with so many talented, hardworking, fun athletes on their running journey. In December (post-marathon and post-finals! ), I took some much-needed downtime. I took some time off from running and studying, hopped in the pool, did some yoga, ate plenty of donuts, watched a lot of Netflix, and drank some wine to celebrate the end of a big year! I spent time at home in California with family & friends - time I always treasure. And I'll close of the year with the husband in Providence, first logging some final joyful miles, and then ringing in 2018 with hopes for continued health and happiness. Wishing the same for you in the new year, and thanks for sharing 2017 with me!